1 - Boathouse Bar & Grille, (231) 869-4588. 2 - Sunshine's Pizza, (231) 869-3444. 3 - 108 Threads, (231) 869-3067. 4 - Pentwater Fair Trade Co, (231) 869-2231. 5 - Pentwater Chamber of Commerce (231) 869-4150. 6 - Pentwater Township Library, (231) 869-8581. 7 - Pentwater Village Police, (231) 869-4630. 8 - Pentwater Post Office (231) 869-8871. 9 - Lakeshore Salon, (231) 869-4602. 10 - Pentwater Outfitters, (231) 869-2999. 11 - House of Flavors, (231) 869-4009. 12 - Pentwater Abbey Bed & Breakfast, (231) 869-4094. 14 - Scott Christopher Homes, (231) 241-1000. 15 - Silver Hills Antiques, (231) 869-5026. 19 - Pentwater Pizza & Grinders, (231) 869-6664. 25 - Petri Gallery, (231) 852-3137. 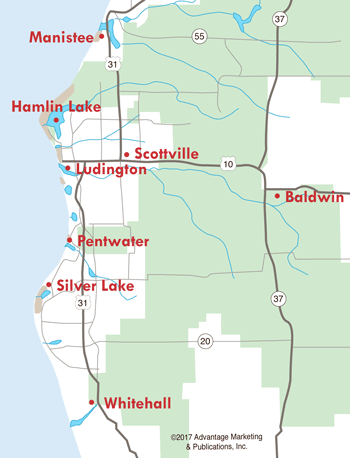 Pentwater is an historic village on the western shore of Lake Michigan. Pentwater's tree-lined streets show off charming Victorian homes and cottages framed by beautiful gardens. Almost everything is in walking distance of the marinas, retail district, public beach and village green, where Thursday evening band concerts have been a tradition every summer for more than 50 years. 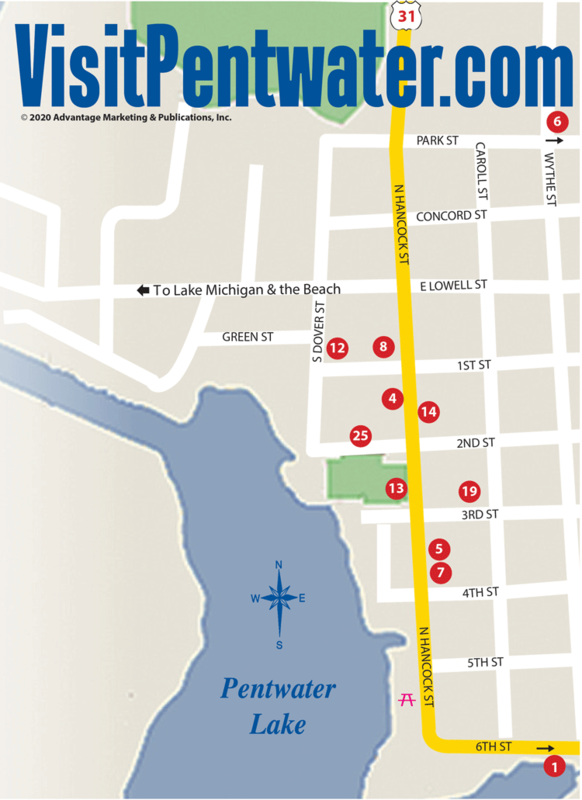 Come visit us, in any season, and you'll see why Pentwater offers visitors a lovely, relaxing vacation destination. You'll want to return to this special place time and time again.